United States Navy Admiral Husband E. Kimmel (February 26, 1882 - May 14, 1968) photographed at his Pearl Harbor headquarters, circa February-December 1941. 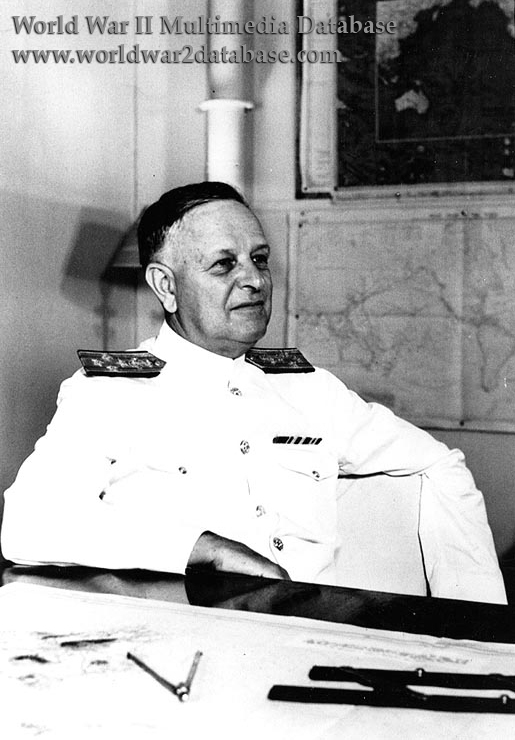 Kimmel was the first naval commander to recognize that modern staffs and communication requirements can overwhelm a battleship's ability to function as a fleet unit, and transferred his staff to shore quarters on the second floor of the submarine base building, from USS Pennsylvania (BB-38) six weeks after taking command at Pearl Harbor in February 1941. This provided adequate room for charts, communications, and operations. Kimmel was temporarily promoted to Admiral (four-star rank) shown here. According to Chief Yeoman Kenneth W. Murray (June 11, 1907 - December 26, 1979) Kimmel changed his shoulder boards to his permanent two-star rank between the first and second waves of the Japanese attack. He reportedly ripped the four-star insignia from his shoulders during the attack according to some witnesses. During the attack, a spent .50 caliber (12.7 mm) bullet crashed through the window, striking Kimmel in the chest, leaving a black mark. Pacific Fleet Communications Officer (later Admiral) Maurice E. Curts (March 25, 1898 - February 15, 1976) was standing near Kimmel when the bullet struck, and overheard Kimmel remark, "It would have been more merciful if it killed me." Kimmel was relieved of command on December 17, 1941 and retired in 1942. He was repeatedly required to testify at the various congressional investigations of the attack. He wrote a book defending his actions in 1955.